The Parish Church of St. Giles stands in the centre of the village, where it has been since the late 13th. Century. The remaining parts of the original building are the south wall from the SW corner of the church along the south aisle, with the three massive Norman pillars in the nave, and the slightly pointed arches that they support. The south transept was added about a hundred years later, followed by the porch, in the 14th. Century. 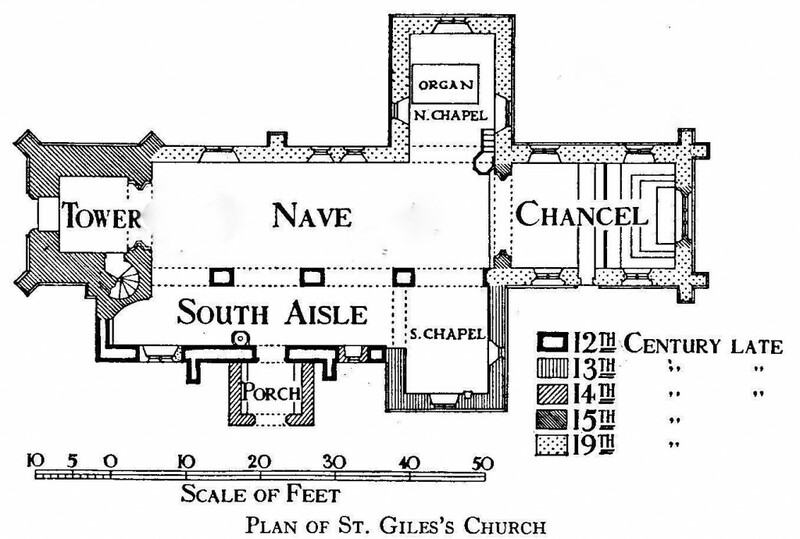 The plan below illustrates the chronological history of the building through the Norman, Perpendicular, Decorated, and lastly Victorian periods of its history. The sturdy, squat tower, with its west door and window, was built about 1400, as was the tall western arch, which many consider to be the noblest feature of the building. Evidence that the tower was added later is shown in the truncated western arch, which runs at its apex into the tower wall; the original plinth on which this arch rested can be seen projecting from the wall below it. The two curious corbel figures which sit high up at the base of the perpendicular arch are to be found nowhere else in Oxfordshire, and are extremely rare. 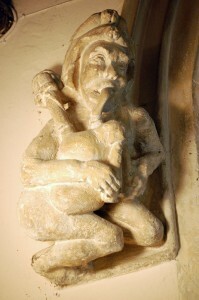 Near life-size, they depict a bag, or chanter-piper, together with his disapproving (?) wife; they probably date from 1400, and legend has it that they portray one Jack of London, who reputedly was the mason who built the tower. Later in the 15th. Century the pitch of the roof was lowered, and new square-headed Early English windows were let into the sides of the original chancel and north wall of the nave. Little else seems to have happened from that period until the changes of the 19thc. In 1840 the east wall of the chancel was found to be out of alignment, and the Early English walls, with their three lancet windows to the east and the roof, were demolished, and replaced by the present chancel in the “revived perpendicular” style; though fortunately the original 15th.c side window stonework was re-inserted. H. J. Underwood oversaw the rebuilding of the north wall of the nave, the construction of the north transept, the re-roofing of the nave & south transept; and in addition the removal of the small clerestory, together with the ornate singing gallery in the tower, which then revealed again the true beauty of the tower arch. A chancel screen was installed during the 1860s, (which was later removed in 2004 to the western arch at the entrance to the ringing chamber). At this time the borders to the nave and chancel arches featured a zigzag pattern, but at the turn of the 19th.c this feature disappeared, as did the coke stove which sat where the font now stands. The church was again re-roofed during the late 1960s, redecorated later, and damp-proofing around the complete structure installed. A completely new churchyard wall was erected during 2005; and the churchyard was closed for burials in 2006. Interior Fabric. (See separate sections for the glass & War Memorial). The oldest feature within the Church is the Saxon water stoup by the main door; only one other like it exists, and is to be seen in Anglesey ! The hexagonal font is Norman, with a 19th.c lid, and the pulpit is a rare Jacobean piece (given by Magdalen College, Oxford) which portrays a very early example of third-dimensional aspect carving on the side panels. The organ dates from 1880, and was made and installed by of R W Rowse, of Summertown, Oxford. In parallel with the restoration of the exterior, much has also been achieved within the church. During the past forty-five years there has been a near-continuous programme of renovation, which has maintained the fabric and improved the facilities for services and activities for other parochial use. In 1962 the bells were re-hung in a new oak frame on sealed bearings, which made the bells much easier to ring than before. During the 1970s, window re-glazing and window frame repairs were undertaken, followed by some replastering of the church, and a programme of proofing all the woodwork against beetle infestation. All the wiring was replaced in 1983, and overhead radiant heaters installed to supplement the existing tubular heaters. A portable nave altar was introduced in 1985, together with a restoring and repainting of the reredos in the chancel, and two years later the whole interior was redecorated. Pews in the south transept were removed, which was carpeted together with the nave crossing & chancel, revealing the true grace of the Norman arches. A complete sound system, with microphones and a loop induction facility, was installed during 1997, and enhanced in 2008. Finally, the oak chancel screen of the 1860s was removed to the west tower arch, opening out still further the chancel, nave and central crossing. By this stands the ancient 18th.c “blacksmiths clock“, which originally was up in the tower room, and which struck the hour on the tenor bell, activated by a stone or concrete weight. ( A rather similar clock can also be seen in Salisbury Cathedral). 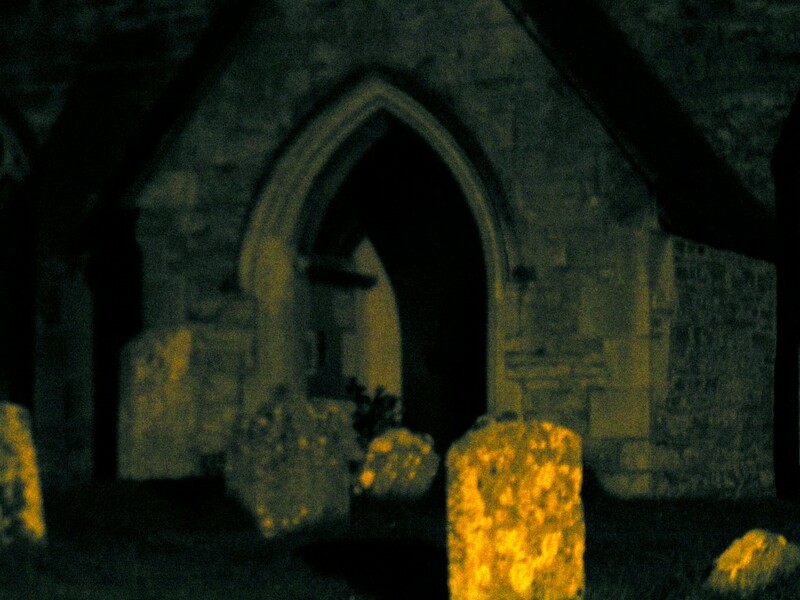 THE GHOST OF ST. GILES…..
For many years it was possible make out the ghost of a hooded monk standing in the ancient church porch of St. Giles, when one passed by on a dark night. Unaccountably, he disappeared during 2010, and has not been seen since. Presumably he may be appear again……. when the council repositions the street lamp by the south-east churchyard wall to its original location !! ST.GILES, HORSPATH FABRIC REPORT, 2016-2017. During the past year we have had the required Quinquennial Inspection, undertaken by Robert Montgomery (following John Perryman’s retirement), with Brian Lowe & Chris Drew in attendance. Fortunately there are no major works required, if considering the financial implications, and the most urgent requirements concerned debris on the tower and south aisle roofs, gutter clearing, and preventing water penetration in the south aisle near the door. Window guards were required on two chancel & two upper lights on the nave windows, and quotations have been obtained for this work. Only minor items were needed internally, some of which have been completed thus far. A new fitted table was made by Chris Drew and positioned at the rear of the nave to enable safe operation of the hot water urn when having refreshments after services, with a small curtain to conceal crockery, etc. This was a large improvement on the small fold-down table previously used. Our thanks to Margaret & Chris for this utility. A new hand-held microphone and associated transmitter has been acquired, and is now in use, and also five of the original heating tubes were repaired. Our thanks go to David Rule for his constant watch over the sound and heating systems in St. Giles. During the past year all nine bell pulleys were replaced with new ones by Whites of Appleton, with the cost of £2724 inc. VAT being met by a donation from the Parish Council, Oxford Diocesan Bell Fund, fundraising, private donations and some of the monies gratefully received from the will of Jean Woodward. Later, Whites also had to replace a sheared slider stop, and a broken slider, the cost being met by the Bell Fund itself. All three church doors have been treated with a mix of linseed oil & turpentine, and the hinges derusted, smoothed down and repainted with black metal paint. The gutters around the church and at the top of the tower have been cleared, and the soakaways opened, checked for debris & cleared. The stone cross which had fallen from the chancel apex has been reassembled by Horspath stonemason Gary Weaving, and we are currently in the process of applying for a certificate to replace it. All the roofing repairs have been inspected by P&R Roofing with Chris Drew, and we await an estimate for this work. The architect’s recommendation that we fit protective guards to four chancel windows has been acted upon, and it seems that approximately £700 VAT + will cover the necessary work. The project to create disabled access has in the past year changed to procuring estimates from specialised pavement and access firms, with a number of quotations being provided, and with Parish Council involvement which hopefully will mean financial support. This project is currently ongoing. I conclude with my grateful thanks to all at St. Giles who work with dedication skill and commitment to the preservation and life of our lovely Church, both within and without, throughout the year. Only by the dedicated commitment of those within our church community are we able to keep both church and churchyard attractive and cared for.